Dessert Darling Wedding Dessert Table, Part 4: Christopher Elbow Chocolates | Dessert Darling delights earned this review of praise here. I added this chocolate addition to the dessert table for obvious reasons. People love Chocolate! And I love Christopher Elbow’s Artisanal Chocolates! 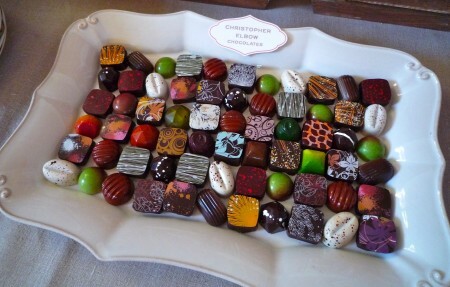 For more information on Christopher Elbow Chocolates, click here. Elbow chocolates are amazing – you must find their new fall chocolate, the brown butter molasses. It tastes like cookie dough inside. I loved these too and want to gift them to friends! !